Some great new details regarding BioWare’s upcoming Mass Effect: Andromeda have emerged. The slow and steady deluge of good information continues, this time giving insight into just exactly who the new character we’ll be journeying with is. @_Anderzzz um no, but a last name does exist. The unfortunate part is that the actual tidbits have been held back for now. But at least we know that the character will likely be just as complete and intricate as Commander Shepard. Creating your character in the original Mass Effect wasn’t just a simple character creation screen, but instead an exercise in making the background for a very deep and significant person. Of course the concept of our new character is well known, being featured in the fantastic E3 trailer, but what we haven’t seen are the usual variations of the armor and outerwear common to the series. 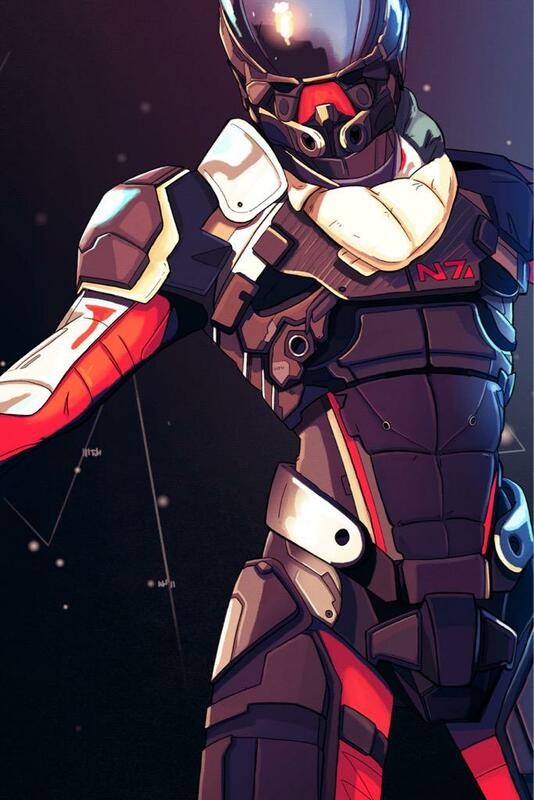 Above is some great concept art of what N7 armor might look like in this timeline. Naturally we’d like to know a lot more and know it as soon as possible, but they want to save the best details for the release during the holiday season of 2016. Mass Effect: Andromeda thus far looks to at least follow along with the expectations that fans have of such an iconic and profound story. Completely different than the previous Mass Effect’s, it follows the story of a group of aspiring individuals as they explore the Andromeda galaxy. It promises to expand on the universe with a unique story, hopefully written by Drew Karpyshyn, a novel dynamic (and procedural generated?) weather system and of course an ending that will be more rewarding than that of Mass Effect 3. To me, though, Mass Effect 3’s ending was not lackluster but just wasn’t what I wanted for the characters. It’s that evoking of emotions that makes the story so incredibly great, however. That’s a sign of good story-telling, making you uncomfortable and having you come back for more.